The rangy back row forward Imanol Harinordoquy was hailed as a shining talent when he made an outstanding debut for France against Wales in Cardiff in 2002, four days before his 22nd birthday, having previously captained the Under-21 team. The 6ft 3in Bayonne-born Basque was then with the Pau club but signed for Biarritz for the 2004-05 season. Harinordoquy marked his second cap against England in 2002 - a Grand Slam campaign for France - with a try in a rare defeat for the team under Martin Johnson who would go on to win the 2003 Rugby World Cup. Alongside Serge Betsen and Olivier Magne, Harinordoquy formed a back row of all the talents, and the trio were prominent in the Rugby World Cup quarter-final win over Ireland in Australia, only to have a bad day when England were victorious in the following week's semi-final. That performance led some Englishmen to dub Imanol as 'Harry Ordinary' and to some eyes he has never been quite the same since. Although Harinordoquy had 30 caps by the time of the 2005 Six Nations Championship he lost form and favour when he suffered a shoulder injury, but appeared to be back in coach Bernard Laporte's good books for the 2007 Rugby World Cup. Rival No.8 Sébastein Chabal was used as a second row, while Harinordoquy started the opening match against Argentina. He was one of the scapegoats for France's defeat and appeared as a replacement only against Namibia, New Zealand and England before starting again in the bronze medal match. 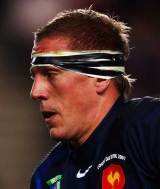 His next caps were two starts against Australia on tour in summer 2008, and Laporte's successor Marc Lièvremont stuck by Harinordoquy in the subsequent autumn Tests, incuding him in Les Bleus' XV for each of the matches against Argentina, the Pacific Islanders and Australia. Harinordoquy remained a key part of the French line-up under Marc Lievremonth in the next few years. He started every match of their 2010 Grand Slam triumph while continuing to be instrumental for club side Biarritz. Despite underperforming as a side during the 2011 Six Nations, Harinordoquy was one of the few French players to emerge from the tournament having impressed. He went to the 2011 World Cup having been named in Lievremont's 30-man squad for the tournament and played a key role in their charge to the final. With new boss Philippe Saint-Andre in charge, he has kept the faith with Harinordoquy and the Biarritz back-rower featured in all five of their matches during the 2012 Six Nations. Harinordoquy has never been afraid to speak his mind and occasionally his comments have landed him in hot water. He reportedly described English opponents in his youth as "extremely unpleasant...so chauvinistic and arrogant" and was also quoted in 2003 saying "as long as we beat England I wouldn't mind if we lost every other game in the Six Nations". The comments probably lost or even gained something in translation.